The Salween Peace Park Committee (SPPC) and Karen Environmental and Social Action Network (KESAN) released a media statement to commemorate International Day of the World’s Indigenous Peoples on August 9, 2018, the 11th anniversary of the UN Declaration on the Rights of Indigenous Peoples (UNDRIP). 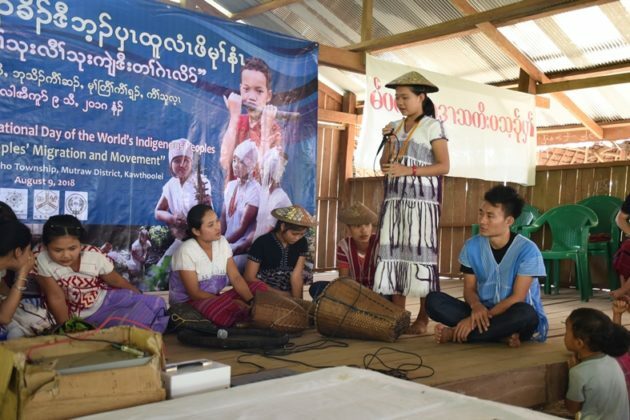 The joint media statement said “war-displaced Karen communities and their allied civil society organizations gathered in Ei Tu Hta Displaced Camp, Mutraw District, to celebrate the International Day of the World’s Indigenous Peoples. The KESAN statement noted that despite – “generation after generation, indigenous Karen communities sustainably coexisting with the lands, waterways, and forests around them” – war with the Burma Army had caused massive displacement and suffering. KESAN explained that after “decades of armed conflict, displacement by large-scale hydropower projects, and the destruction of their ancestral forests by illicit extractive and trafficking activities” Karen people have seen enough destruction of their lands and communities. The commemoration event included panel discussions, cultural and drama performances, a photo exhibition and a documentary screening. The statement said the “SPP works towards achieving ‘inclusive conservation’ and cultural preservation, while building peace through recognition of indigenous Karen people’s rights to self-determination over their ancestral territories in Mutraw District of Kawthoolei, Southeast Burma. The SPP is part of a broader international movement that advocates for state governments’ inclusion of ICCAs as a protected area classification along with specific legal frameworks. This would support the legitimate ICCA custodian’s authority to sustain biodiversity and environment-friendly livelihoods, as well as to prevent and respond to threats.